When you are in Corfu or Parga, you can take a day trip and visit the tiny islands of Paxi, which lie South of Corfu and on the northern side of the Ionian Sea. These islands are very cosmopolitan with many yachts from all over the world moored in the ports during the summer months. Paxi island has stunning beaches with clear blue sea. Three villages on the island, Gaios, Lakka and Logos are very quaint having traditional architecture and beach promenades which allow for long relaxing walks. Gaios is the capital of Paxi Greece, and from here you can take a boat to the exotic uninhabited islet of Antipaxi. Here you will find some of the most beautiful beaches in Greece. “Pax” in Latin means peace and that is what you as a tourist, will find on this amazing island. Couples and families will enjoy the lush green landscape and the many sparkling white sandy beaches. This serenity was not always a feature of Paxi island. Its history is volatile. Paxi Island was conquered by the Venetians in the Medieval era, as well as by France and the British. The island was often besieged by the Turks too. It is hard to imagine this, looking at the current day peaceful surroundings. Gaios, the capital and main port of Paxi island, has many interesting tourist facilities. A small green island with the ruins of an old castle is found at the entrance to the port. At the port there are wonderful fish taverns serving up local traditional dishes. In the Summer months, one can watch the many yachts and fishing boats moored in the blue waters of the port. A short walk from Gaios takes you to small coves with clean water where one can swim. In summer, boats leave frequently from the port, taking tourists to the nearby lush green island of Antipaxos, where you will find more exotic beaches. At the northernmost point of Paxi island lies the coastal village of Lakka. Lakka offers another wonderful retreat for tourists. Seaside restaurants serve up delicious traditional Greek cuisine while you take in the stunning views of the port. If you venture away from the port into the village, you will find colourful houses and enchanting narrow stone paths. Logos is the third harbour settlement on the island. Two interesting features here are the old stone windmill and the soap factory. Both offer an insight into the history of the island and also offer a great vantage point from which to observe the magnificent sunsets. According to Greek legends, Neptune, the sea god, snipped off a piece of Corfu with his trident, creating the Paxi islands as a cosy and safe retreat for himself and his consort, Amfitryti. 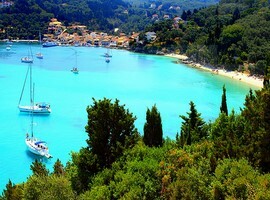 The smallest of these islands is Antipaxos, also known as Antipaxi, and it belongs to the municipality of Paxi. 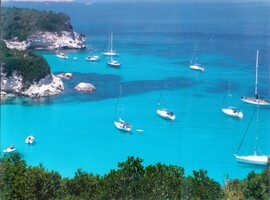 Antipaxos is a totally uninhabited and unspoilt island lying 3 kilometres to the South of Paxi. For those interested in history, this small 5 kilometre square island is where the brave Souliotes mountain people fought and resisted the great Ottoman empire. They were finally defeated in 1803 and moved away from the island to other parts of Greece. The island today stands totally devoid of modern life. 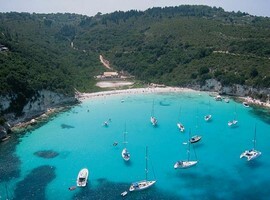 In its pristine uninhabited state, the island of Antipaxos offers some of the best swimming and snorkeling beaches in Greece. The two main beaches are known as Voutoumi and Vrika and both of them offer safe swimming for tourists. A short distance south of these beaches are some small and secluded coves. 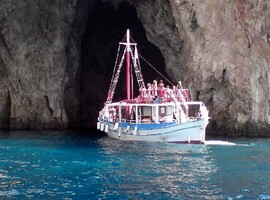 To get to Antipaxos, take one of the water taxies that run from Gaios. These usually run every hour and the trip takes about 15 minutes. One of the first Christians, Gaios, preached on the islands during the first years after the death of Christ. The capital town of Paxi, is named Gaios after him. Gaios is a small town with a population of about 500 locals. Most of them earn a living from tourism, fishing and olive growing. Gaios is surrounded by lush green groves of olives and it is a very picturesque village. The majority of the cultural and trade activities of the islands take place on Gaios. Although the island is filled with cosmopolitan tourists arriving on private yachts and boats, it still manages to retain its strong traditional character. Wander through its narrow alleys and you see quaint 19th century buildings with a view down to the port. Paxi has always been a popular destination for Italian and British tourists. Logos is another of the main villages of Paxi. When Gaios is busy, Logos is simple and peaceful offering a nice contrast. Logos has a small harbour which comes alive during the summer months. The beaches offer safe swimming, boating and fishing and seaside taverns which serve delicious traditional food. Logos also offers lovely walks along pathways into the surrounding areas. 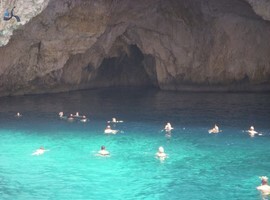 From Logos, you can organise an excursion around the island or a trip to Parga on the opposite coast. 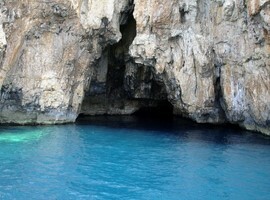 It is safe to do this trip on your own and explore the nearby coves and beaches. This is a great trip for families and couples alike. Logos does not offer any intense night life but this you can find it found at Gaios! However, for those appreciating tranquillity and peace, this is the place to be at night. No traffic noise and the lights of the seaside taverns reflecting on the water make a wonderful experience. Logos hosts two music festivals. The International Music Festival is a popular event with classical music that runs from late August to early September every year. Also, the Spring Music Festival takes place in May and showcases Greek performers. Jazz concerts are also held in the village. Despite its small size, Logos can accommodate many tourists with its rich selection of rooms, hotels and villas. 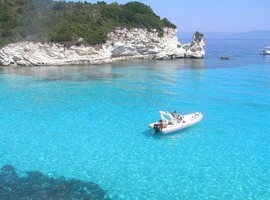 Voutoumi is a white pebble beach on the north eastern side of Antipaxos Island. The beach is enclosed inside a large cove with high cliffs on either side. This setting offers great snorkeling opportunities near the rocks and swimming in the shallow waters. It is perfect for families with children. Voutoumi attracts many local visitors from the surrounding islands. 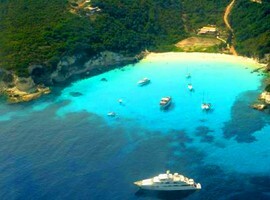 Tourists arrive at Voutoumi beach by a variety of private yachts, water taxies and tour boats. Bring your own umbrellas as sun beds are scarce. There are no shops on the islet, but you can get traditional snacks at the tavern on the hill and taste the local wine at one of the taverns near the beach. 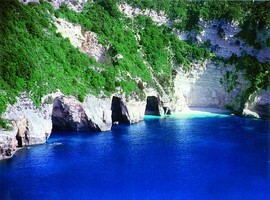 Monodendri is a cove situated 9km north of Gaios, the capital of Paxi. The beach has white and golden pebbles and crystal clear waters offering an amazing swimming experience. You can get a meal or some refreshments at the small tavern on the shore. Umbrellas are available here too. Monodendri is easily accessible via the main road. If you want total privacy, leave the crowds behind and take a stroll along the beach to one of the many secluded coves which you can claim as your own for the day! A short walk from the village of Logos, 7km north of Gaios, will bring you to the beach of Levrehio. This is a very popular beach for both the locals and tourists and as such can get very busy, especially during the summer season. However, because the beach is large, one can find a space to enjoy it despite the crowds. Children can swim safely and a cool shade is provided by the many natural olive trees surrounding the beach. It is an extremely pretty beach with a quaint tavern offering delicious food with a friendly local flavour.